By now you all know how very much we love shrimp. It comes in handy to have an ex-shrimp monger on hand to clean and devein my shrimp. I love cooking it but not so much cleaning and deveining it. Joel not only obtains the best shrimp around but he really does do a great job of cleaning and deveining. ( I think it’s in his DNA) In any event we make a pretty good team when it comes to shrimp dishes. So now on to this delicious dish. I didn’t feel like grilling and this dish was calling out to me. 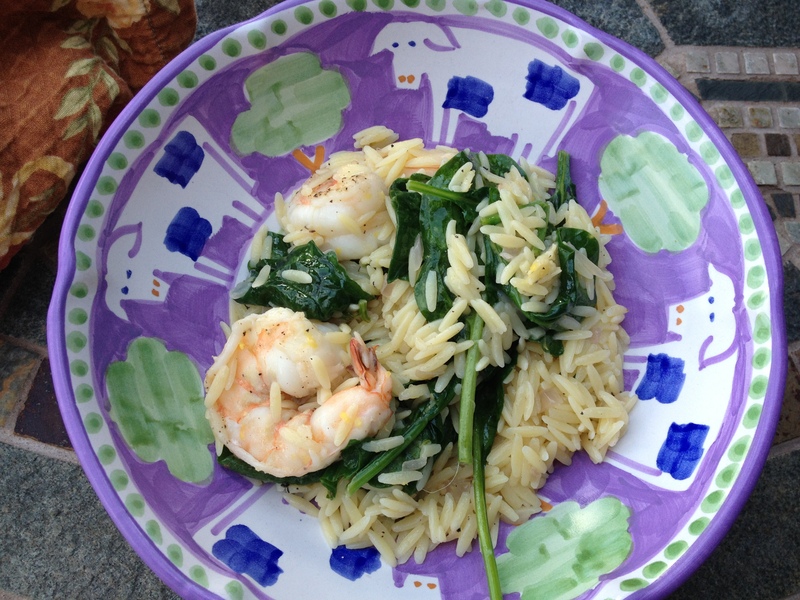 I saw Giada de Laurentiis make a shrimp scampi on her show and she made it with arugula , it looked so awesome and light I figured I’d do it my way and make it with spinach even though I knew Joel wouldn’t eat the spinach. This dish was pretty easy to pull together once shrimp was prepped. Not a whole lot of ingredients, and whole thing took about 1/2 hour. This dish was very light in flavor and a perfect summer night meal, doesn’t have to be served super hot , can be room temperature. 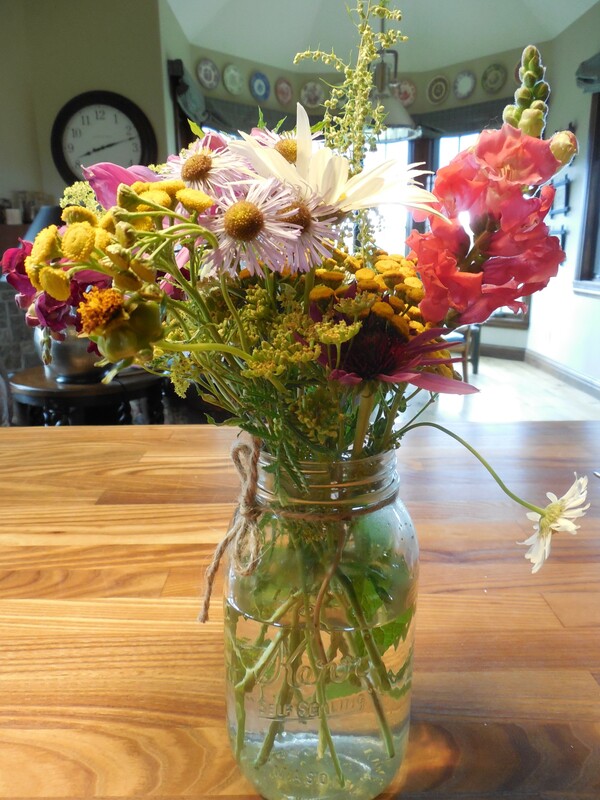 Thanks again to Giada for the wonderfully inspiring recipe. *once the shrimp is prepared this dish is a snap. Have your fish store clean and de-vein your shrimp for you. 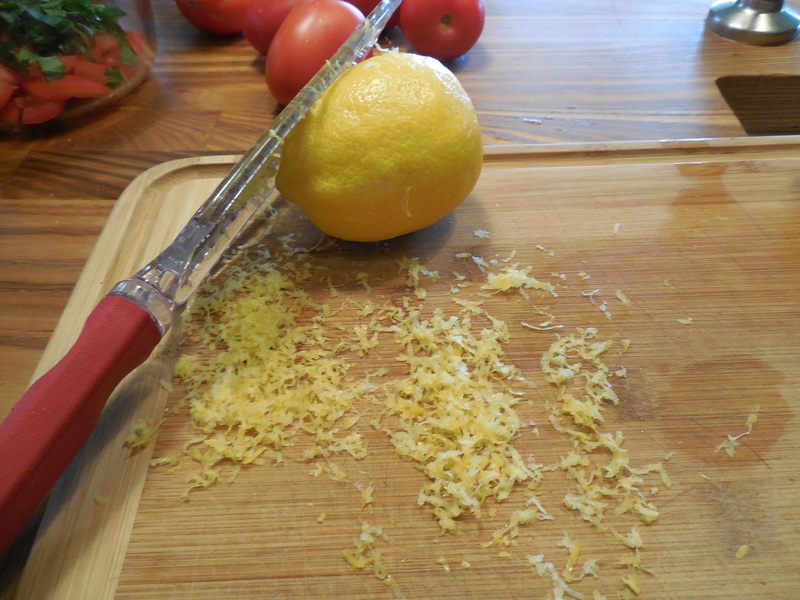 In a small bowl, whisk together the olive oil, lemon zest and lemon juice, salt and pepper until smooth and set aside. 6 ounces of spinach , I used baby spinach, use whatever greens you like. Giada used arugula . Cook orzo according to directions. Drain and reserve 1 cup of the pasta water. Place shrimp in a bowl and sprinkle with kosher salt and some freshly ground black pepper . 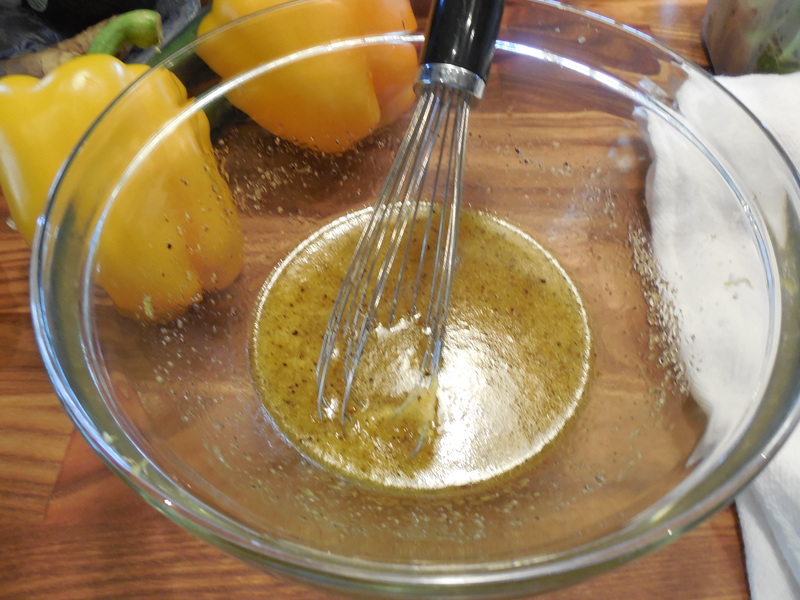 Heat the 2 tablespoons of olive oil over medium high heat. Add the chopped shallots and cook until soft for a few minutes. Add the shrimp, cook shrimp until they turn pink and are just cooked through depending on the size of your shrimp. When shrimp is cooked through remove the shrimp from the skillet. Increase the heat to high and add the 1/2 cup of wine, allow to boil up and scrape up all the brown bits from the bottom of the pan, cook for another minute or so until most of the liquid has evaporated. 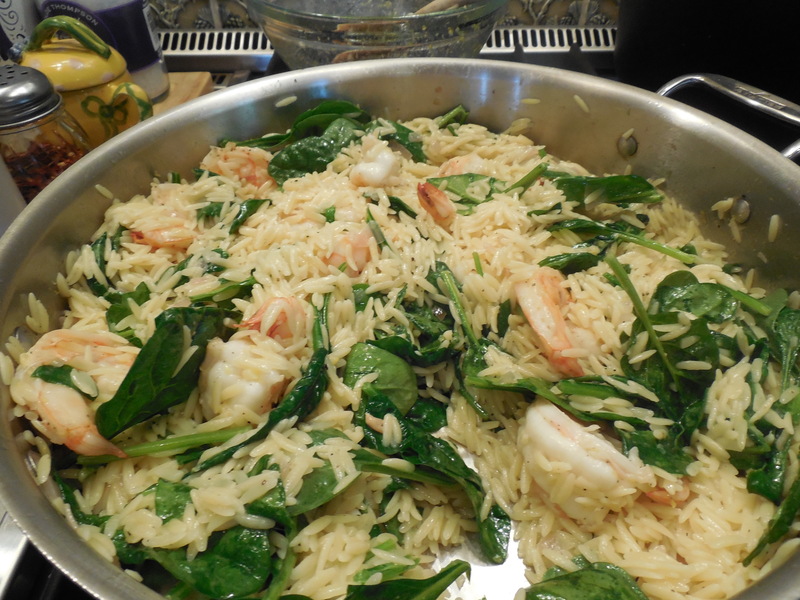 Then add orzo to the pan along with the vinaigrette and the spinach and let it wilt down. I added most of the reserved pasta water , you’ll use as much or as little as you need, I used whole cup of reserved pasta water. 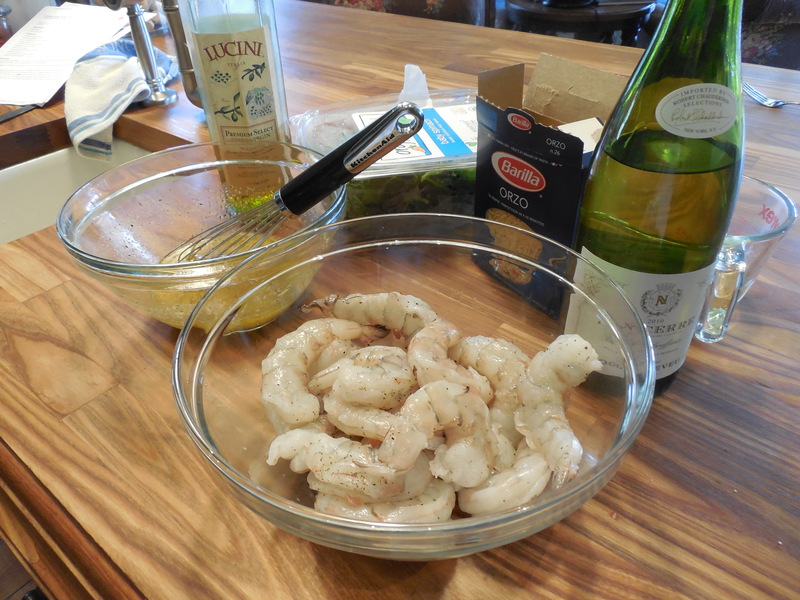 Add the shrimp back in and toss well until all the ingredients are well coated. Serve up and enjoy. So now on to this delicious dish. I didn’t feel like grilling and this dish was calling out to me. I saw Giada de Laurentiis make a shrimp scampi on her show and she made it with arugula , it looked so awesome and light I figured I’d do it my way and make it with spinach even though I knew Joel wouldn’t eat the spinach. Our friend Drew was over and he loves spinach so we ate Joel’s spinach, once again it’s his loss. This dish was pretty easy to pull together once shrimp was prepped. Not a whole lot of ingredients, and whole thing took about 1/2 hour. This dish was very light in flavor and a perfect summer night meal, doesn’t have to be served super hot , can be room temperature. Thanks again to Giada for the wonderfully inspiring recipe.